I had decided a few years ago never to run a race again. 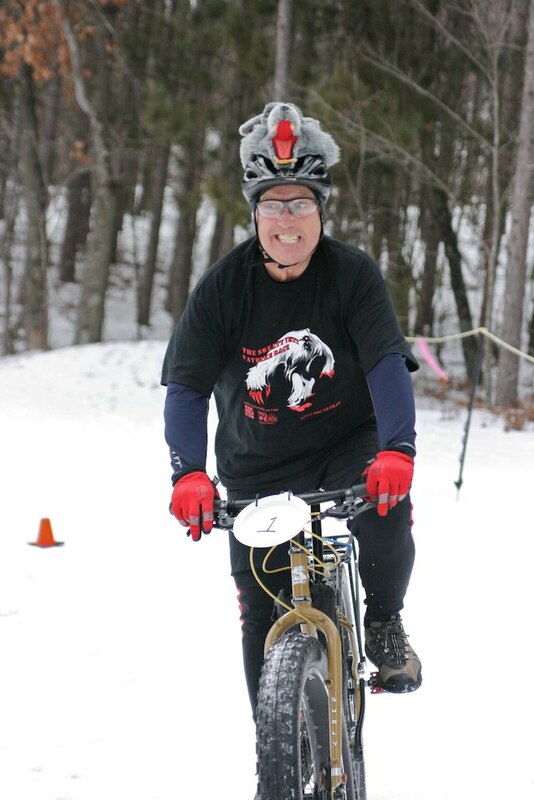 After 14 years of being the race director of the Buzzard Buster mountain bike race, and no one getting seriously hurt, killed or sued….I figured I should count my blessings and call it a career. Then…these fat bikes come along and bring a completely different “race” mentality with them the fun factor was back. 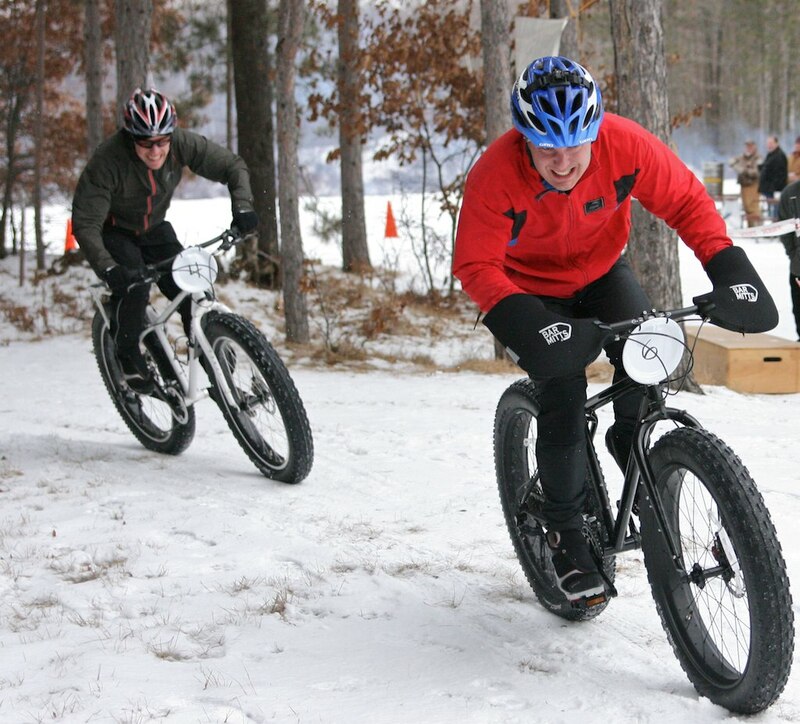 In fact, at fat bike races the fun factor is so high and the seriousness quotient so low that that I have been tempted to step back into that race director role. 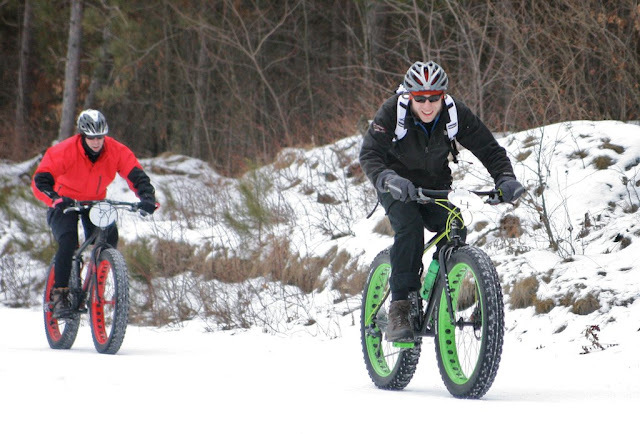 The concept of racing fat bikes…in winter, on snow, is in itself an insanely fun idea that opens a whole new season to cyclists who tend to let their bikes hibernate until spring. 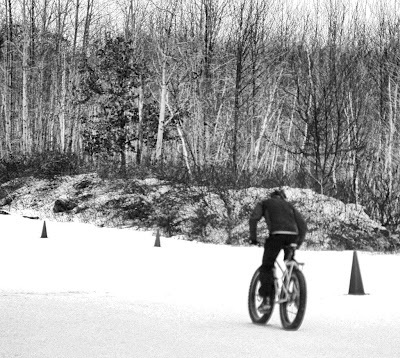 Conditions could be anything – bitter cold, deep sloggy snow or a race day with postcard perfect softly falling snowflakes and a rock hard course – like we had at the inaugural Sweaty Yeti at the Levis Mound trails. The plan for this fat bike race was hatched this past fall at Gnomefest, realizing that at Levis Mound, we had the perfect venue to run an event. A warm chalet, singletrack and ski trail and start field right out the door and if conditions changed, the equipment to handle it if needed. Besides, it was an opportunity to show off the trail a little to anyone who maybe hadn’t been here before. Plus…it sounded like a crazy enough idea that I had to do it. There was a mixed peloton of racers at the line for the LeMans start, from super fit riders to others who just love to ride with a couple friends all day (or are recruited last minute). There was a fair amount of pre-race joking around and “hydrating” by racers and spectators alike. This was a race though, so although there was some some serious pedal crunching over the next three hours, the fun factor remained high throughout. I like the bunch of people who showed up for the race. They are about the friendliest bunch of folks around without any of the pretentious weekend warrior posturing that one might have to wade through in other racing. I raced for a long time, ski and mountain bike, and made many friendships along the way, but in the past year or so, attending Gnomefest and now the fat bike scene, has introduced me to a whole new group of people that aren’t afraid to sit down and share a few beers and talk bikes (always have to do a little of that). At in this inaugural Sweaty Yeti, I found the friendly nature of the “racers” lured me to pull off my directors hat, put on a helmet to give the race thing a go. My past years of racing were buried inside somewhere, and I tried my best to find them, but lack of fitness made the laps hurt! No matter, I rode within myself on the later laps, enjoyed the ride and knew the post race camaraderie would be reward for the pain. In the end, the victors were crowned (with some sweet funky hats) and the “Most Fun Team” awarded, and prizes to just about everyone else, thanks to Sand Creek Brewery. The riders seemed to think the day went well, was fun and were appreciative. Some riders headed out while others stayed to hang out around the fire long into the night. The snow then kicked up a notch as to signal a good ending to the day with good people. Steve, those trails RULED! you did such a great job grooming them and the course couldnt have been better. 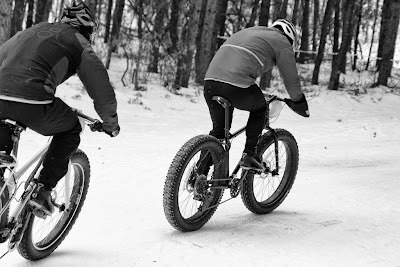 It had everything you need in a Fatbike race, gritty double track and fun flowy singletrack. Hanging out with some of the guys from Sand Creek was awesome, good to talk to some fellow brewery employees. I didnt think id be making it up to levis in winter and holy cow am i glad that i did. It was a amazing time and I cant wait for next year! Thanks!!!! 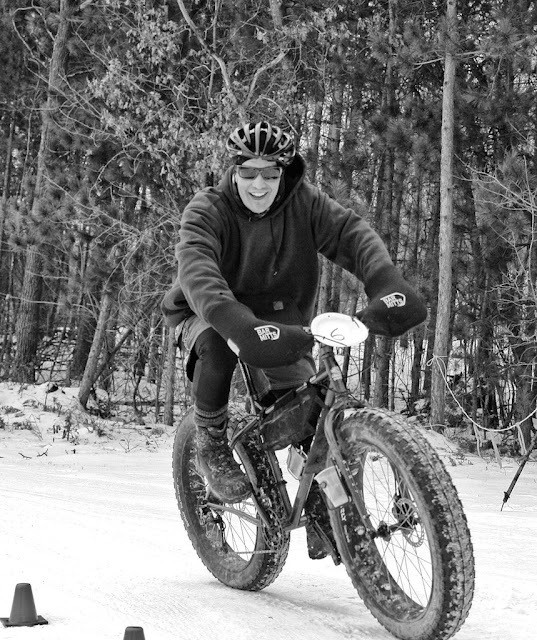 It was fun and our first Fat bike race-perfect weekend! Steve, Awesome job! Looks like it was a lot of fun. I would like to talk with you about what I’m planning to do here at Telemark Resort in Cable, WI. Being a bike guy and now being in charge of all Telemark trails, I am planning to have a single track MTB trail that will be open all year. We actually plan to groom it next winter, and of course would like to have a race. Maybe we can brainstorm or even offer you the venue for your “2nd annual” if you are planning a repeat?? We’ll be staying at Levis because we want to showcase our trails and our facilities with the chalet and starting field make it work well. The calendar is really full and we’ll most likely move our date to maybe earlier or a week later to avoid MN events where we draw riders.